We often get messages from readers wondering what to eat before a race. We can hands-down say that this is the dish we personally turn to most when we have a long race or training run planned. This truly is a wonder dish for athletes before racing. 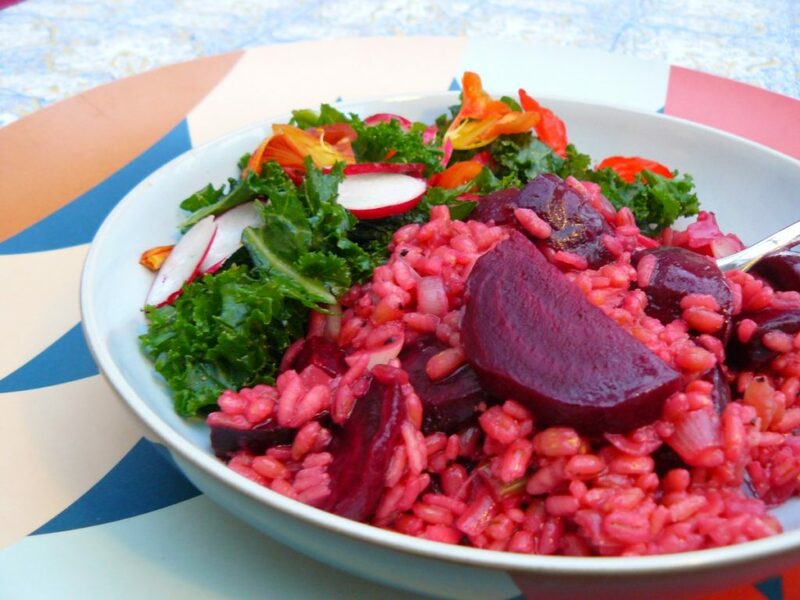 The combination of white rice and barley ensures quick and slow release of carbohydrates, while studies have shown that beetroot consumption increases aerobic efficiency when exercising. (Another new meta-analysis by Nick McMahon et al backs this up). And if you’re wondering what we have for breakfast the morning of a race? We always have a bagel and jam, and a good cup of coffee. There is no particular science of a bagel over toast, which lots of athletes like to eat on race day, we just like them better! If it’s a long time before the race starts, and we begin to get peckish again, then we’ll have a bite of a banana before we start, too. Rinse your pearl barley and then put it on to boil in fresh water for 20 minutes. After the barley has been boiling for 10 minutes, you’ll want to start the next steps of the dish. In another medium-sized saucepan, fry off your onion and garlic in the oil for 5 minutes. Add the fresh and dried herbs, and season with salt and pepper. Make a litre of vegetable stock with boiling water, and cut the corner off the vacuum packed beetroot and pour the juice from the packet into the stock to make a pleasingly pink cooking liquid. Add the risotto rice to the pan with the onions and add a ladleful of the pink stock and stir well. Drain your pearl barley - it should be much softer than when it started, but still have some texture to it - and add to the pan with everything else. As the liquid is absorbed by the grains, keep adding another ladleful and continue to stir. You may not need all of your stock - stop adding it when you notice that the rice and barley aren’t taking in any more liquid. If more is needed, just add extra water. Chop the beetroot into chunks - when it has heated through, your barlotto is good to go. What’s your preferred dinner the night before you race? How about breakfast? Great post. i love this . Thanks for sharing.